Yeah, I know - you read that headline and all the snark in the world comes to mind. Like, "how about get a hitter?" but since we're slogging through what seems to be an eternity waiting for even a shortened inter-squad game to begin, let's talk lineup. Specifically, what that lineup ought to look like. There are a lot of interchangeable parts there - but you can probably cement the top two and the bottom two in stone. Cust is almost certainly your #3 hitter, but from there, it's anyone's guess. I'm using Bradley instead of Saunders or Gerut or Gross or any other of the dozen options they have in left field specifically so I could use the handy Baseball Musings Lineup Analysis Tool. This tool will use wOBA (weighted on base average - it uses linear weights to assign a coefficient to every contribution that a batter makes, divided by plate appearances. Neat) and Slugging Percentage to come up with an optimal lineup relative to run production (not run prevention, however - so this isn't a wins above replacement argument, which is a good one when talking about Bradley vs. Saunders vs. Gerut vs. Gross vs. your Aunt Jennie). Anyway, using any kind of goofy platoon situation in left made it difficult to use the tool, so just go with it. Yes, Jack Cust, leadoff hitter. In fact, there are 30 "best lineup" projections and in 23 of them, Jack Cust is the leadoff hitter. In none of them is the leadoff hitter Ichiro or Figgins. In 21 scenarios, Ichiro is your #3 hitter. What can we take away from this? Well, that I'd wager my first, second, and third born that we will never, ever see this lineup on the field for the Mariners in 2011, or any season thereafter, or in any alternate universe (just in case Fringe is on to something). However, it does lend some credibility to the notion that Ichiro is a little bit wasted in that leadoff slot and I have been wondering if Wedge would ever consider a lineup where he's more in a role as run producer than catalyst. Good stuff on a cold day to get you thinking about warm days and baseball, no? Go find other projection systems and use the tool, it's fun. 1. The Enigma is a great nickname. Love it. 2. Mr. Barr failed to mention a little wager we made at Log HQ a little over a year ago. The bet: Brandon Morrow must throw at least 180 innings AND strike out 200 batters in a single season. The term of the bet is 10 years. So if Morrow can throw 180 IP and strikeout 200 just once over the next 9 seasons, I win a frosty adult beverage. Morrow's 2010 line: 146 IP, 178 K. Close, but no cigar. Or beer in this case. If he stays relatively healthy he should hit the 180/200 mark in 2011. Checkout his 2nd half line from 2010: 3.69 ERA, 46.1 IP, 37 H, 19 BB, 1.209 WHIP, 13 K/9. Wow! With all of this Morrow talk my mind can't help but wander to the Brandon the Mariners received in return for Morrow. Brandon League regressed a bit in 2010, but overall had a solid campaign. His numbers were closer to his career averages than his stellar 2009 season. Mariner fans can expect another heaping helping of League out of the pen this year. With David Aardsma on the shelf for a while, League is a likely candidate to get early season save chances. I have a sneaking suspicion the front office wants to see his star shine as brightly as possible in order to erase any doubts about trading Morrow for him. If that means saves, and a bigger 2012 contract, so be it. There is no reason League can't repeat his solid 2010 performance. But I still have to wonder why, in a rebuilding year, you would ever trade a young starter with a high ceiling for a veteran bullpen arm. Makes me wonder if Jack Zduriencik, Chuck Armstrong and the rest of the front office wanted to put the Tim Lincecum whining to bed by sending away the most obvious reminder (Morrow) of the team passing on the local phenom in the 2006 draft. Here's to a great 2011 campaign for both Brandon's. I'll have my frosted mug ready in September. We look forward to seeing what everyone comes up with! If you haven't already, be sure to Like us when you're there or in the right column of MarinerLog.com. Thanks! Winner of perhaps the dirtiest and/or most suggestive title in Mariner Log history aside, let's talk briefly about Doug Fister and his change-up. Now, I've been thinking way too much about Doug Fister. I usually say something mean like "not good" or something of similar ilk. But it started occurring to me that this team actually needs Doug Fister (I just threw up in my mouth a little). We really do - we need him to be good. We need Doug Fister to be a good #4 starter or so, worth about 2 wins (2.9 last year!) in order for this team to be at all competitive (with much luck in other areas, yes). So with that in mind - I present to you, my cursory glance at Doug Fister. Yes, if you add up the percentages, you don't get 100%. Gold star for you. Pitch F/X data always misses a few. 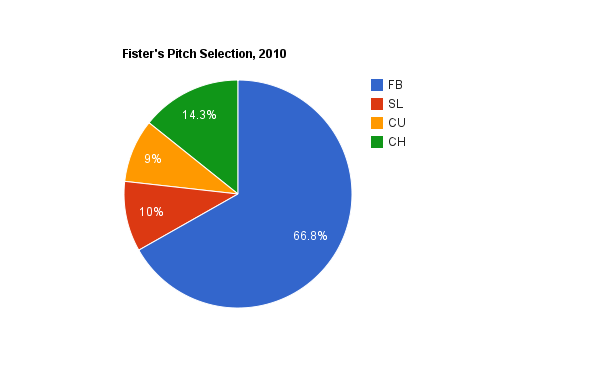 So Fister relies heavily on his fastball, and his secondary pitch is very much his change. His K/9 in 2010 actually dropped to a pretty miserable 4.89, but the strikeout really isn't his game. A lot of his success was in his ability to control the longball as his HR/9 went from 1.62 in 2009 to a stingy .68 in 2010. For reference, Felix Herndandez had a HR/9 of .61. So Fister did well last year. FIP stands for Fielding Independent Pitching. It's a measure of all those things for which a pitcher is specifically responsible. It uses an algorithm plus a league-specific factor to round out the number to an equivalent ERA number. FIP helps you understand how well a pitcher pitched, regardless of how well his fielders fielded. Emphasis added by me. xFIP is Expected Fielding Independent Pitching. xFIP "normalizes" the home run component. Research has shown that home runs allowed are pretty much a function of flyballs allowed and home park, so xFIP is based on the average number of home runs allowed per outfield fly. Theoretically, this should be a better predictor of a pitcher's future ERA. Okay, now that that's established - Fister's xFIP vs. lefties is pretty out of whack with his ERA at 4.52. Basically, the math just doesn't buy that he can sustain this level of performance. Part of it is also, and this is actually pretty significant, that his batting average on balls in play (BABiP) specifically on fly balls (which is the only kind of ball that's going to leave the park) was .094. The AL League average BABiP on fly balls was .138. So just by virtue of dumb luck, he's going to regress on how many hits he gives up on fly balls and sure as hell a few of those will leave the yard. So, what do you do if you're Doug Fister? So a little more geekery: Fister throws his change about 14% of the time. His change, however, is his best pitch. His change is 1.69 runs above average (wCH/C). That puts him in top-15 best changeups in baseball in terms of its value. Like, more valuable than Sabathia or Halladay or Hamels. His change is really good. His curve, by comparison, is horrible at -2.28. He is frequently going to his slider and his fastball in 2-strike counts, and I'm here to ask Doug Fister to just try going to the change in two strike counts. Yes, yes, I know you set up your change with your other pitches, but that's for the coaches to figure out - what I'm saying is, Doug Fister, know thyself. Use your change. We need you. A fantastic post over at RJ's Fro, who blogs in support of our MORTAL ENEMIES the San Diego Padres. Avenger-in-Chief, who runs Avenging Jack Murphy is the author, so be sure to let him know just how much the Seattle - San Diego rivalry means to you. Be honest, San Diego vs. Seattle is like North Carolina vs. Duke, Dodgers v. Giants, Yankees v. Red Sox, UCLA v. USC, USA v. USSR, or Spy vs. Spy. Seattle was a city founded on a belief of synergy amongst those inhabiting their corner of the U.S. and would ultimately choose a team mascot that reflected that particular ethos. In contrast San Diego opted for a mascot that was in conflict with the indigenous people of their corner of the U.S. If that doesn't boil your blood, then you're just not a red-blooded-sports-fan. Let's take a look back at what we sent, and what we got, for Cliff Lee, shall we? So we dealt Phillippe Aumont, Tyson Gillies and J.C. Ramirez for Cliff Lee. And there was great rejoicing. Aumont was probably considered the prize in that haul, and while the Mariners had decided he profiled better as a reliever, the Phillies were going to turn him into a starter and many of us gnashed our teeth and muttered "Brandon Morrow all over again". Well, turns out the Mariners might have been right. The starter experiment failed - in 11 starts he went 1-6 with a 7.43 ERA and 1.87 WHIP at Reading. They demoted him to Clearwater (ahem, high A) where he went 2-5 with a 4.48 ERA and 1.607 WHIP and they ultimately turned him back into a reliever. Yowsa. Gillies was hurt most of last year and got in only 28 games, mostly at AA. His totals were a .243 BA with .302 OBP and .336 SLG. 2 HR's and 2 stolen bases. Yawn. But he's way better than this, and a lot of listy-types put him in, or on the cusp, of the Phillies top 10 prospects. He's probably still 2-3 years away though. Ramirez split time at Clearwater (A) and Reading (AA) with a better line than Aumont, but probably not what the Phillies may have had in mind: 4.82 ERA 142 IP, 152 H, 115 SO, 1.359 WHIP. He seems to appear in most top-30 lists, and as high as 17 overall Phil prospects. We then dealt Lee and Lowe for Smoak, Beavan, Lueke, and Lawson. I'll skip Lowe because I suppose most of you know his schtick. Smoak: Well, we've already talked about him. He should be pretty good, but he has a lot to prove still. Beavan usually gets ranked anywhere between 12th and 9th on the prospect list for the M's and will have a pretty legitimate shot at a rotation spot come 2011. He made two stops in AA and one in AAA last year and overall he posted a 3.90 ERA, 1.158 WHIP, 168 IP, 174 H, 101 K's. He only walked 21 batters over 168 innings pitched. He's a strike throwing machine, doesn't miss many bats, and while he may never be a superstar in the league, it's very possible he could be a serviceable #4 starter on a competitive team. I'll also add that he got hit awfully hard in his time at AAA. Lueke last year: 63 IP, 48 H, 94 K's, 1.86 ERA with a 1.000 WHIP. This includes stops at A, AA, and AAA - and he pretty much dominated at every level. He should be in the bullpen to start the season, whether you think he's a nice guy or not. Lawson: profiles as kind of a Brendan Ryan type with a tad more power (read - he's actually hit some home runs!). Between Texas and Seattle AA squads last year, he hit .293/.372/.439 over 527 PA's. He's not afraid to draw a walk, he runs a tad, he also peppered in 9 dingers. He's apparently quite gifted defensively (2b) as well. He's 25 this year, so he's not a baby and it's kind of time for him to either do his business or get off the pot, if you will. I could see him in some kind of utility role with the squad in 2012, and perhaps if things go either really well for him early on or really poorly for the M's early on, he might show up in 2011. 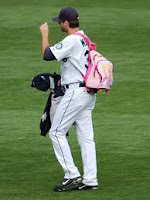 So, objectively, I have to say Cliff Lee was pretty well played for the M's. Nice work, Jack. Why am I smiling? This is easy. I've been reading a lot about Michael Pineda lately, most of it as it relates to fantasy baseball - and some of the commentary is just downright absurd. There was even one site that uttered "the next Felix Hernandez" perhaps because looking stupid was better than just not being looked at whatsoever. With this in mind, let's just take a cursory glance at Pineda and what we might expect going forward. First things first: It's not a given that he's even going to break camp with the M's despite the fact that he may very well have the second or third best "stuff" relative to the rotation come March 31st. There is the idea of keeping him in the minors long enough to tick his clock up one more year in terms of team control (2017, I believe). But my contact suggests that while the Mariners are more concerned with Ackley's service time, they may be more willing to give Pineda a legitimate shot at the rotation to begin the season. I'm not sure if that's because he has the potential to offer so much more than a replacement player in comparison to an Ackley at 2b (versus, say, Ryan or anyone else) but that's what the word is. The good: He's huge and he has fantastic stuff. Pineda, on the whole, trades places with Ackley on most lists as the #1 prospect in the Mariner system. He has "ace" potential by many accounts with most agreeing that he should develop into a solid #2 starter on a competitive team. He just turned 22 (yeah, Felix is only 24 right now...wow) and his 2010 between AA and AAA looked like this: 3.36 ERA, 139 IP, 121 H, 154 SO, 1.112 WHIP. He had a 9.9 K/9 and only walked 34. In fact, his K/9 at AAA was damned near 11. That's pretty friggin good. The bad: He's never faced major league hitters. That inherently means great risk - just ask Homer Bailey. His stuff is still very raw, he needs to develop his splitter, and he needs to improve against left handed batters. Pitchers are just fickle - it's very hard to predict baseball players, but it's probably the most difficult to predict great pitchers. While Pineda has all the physical tools to be a tremendous pitcher, there's a fine line between being Felix Hernandez and Freddy Garcia. We will know a whole lot more once we see him face big league hitters. Whether he's on the major league roster in April or not, Pineda is a player to be excited about if you're a Mariner fan. Just don't expect a Cy Young. Michael Saunders: 2011 or Bust? Based on a little back and forth over at the Facebook page I had with some readers, I thought it was high time we took a look at Michael Saunders and just what we might expect from him in 2011. First, the good: Michael Saunders has a really quite impressive resume when it comes to hitting in the minor leagues. Over six seasons in the minor leagues, he compiled a .276/.361/.441 triple-slash line while showing increasing power, tremendous bat speed, and demonstrating fantastic defense and a plus arm. This isn't padded by the low rookie leagues either - his totals at AAA are .274/.346/.449 with 16 home runs in 109 games although he has begun to abandon his running game with just 11 swipes in the same time frame. Baseball America once ranked Saunders the #4 PCL prospect just behind Buster Posey, Neftali Perez, and Travis Snider. This is a guy that ought to be a contributor on a major league team. His minor league time was highlighted by 2009 where he went .310/.378/.544(!) with 13 HR's and 58 runs in just 64 games at AAA. That got him his call up to the big club. Where he subsequently laid an egg. The bad: Saunders strikes out too much for a guy with his particular batting profile. He's probably the type of hitter who, in his prime, could hit 20 HR's, but is probably more of a 15 HR, 12 stolen base kind of guy. His K rate in the minors was typically in the mid-to-high 20's with a couple of seasons in the low 30's. 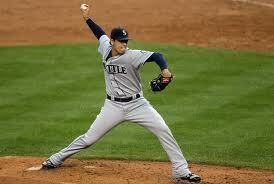 His time in the bigs showed about the same kind of strikeout rate with 32.8% and 29.1% in '09 and '10 respectively. This is probably going to prevent him from ever hitting for particularly high average. It's hard, very hard, to hit for high average when you strike out 30% of the time. To expect him to hit higher than .270 is probably too much. He has struggled mightily to hit left handed pitchers at the major league level (.202/.256/.345) although he demonstrated an ability to hold his own against southpaws (and even earlier in his career, he hit better vs. lefties). This has resulted in all sorts of platoon cries, which to many of the Mariner fanbase sound ridiculous for a 2011 team that is probably going to battle for nothing other than trying to stay out of last place. And I'd have to say the Log agrees with that sentiment. Without getting terribly geeky on you, he has gotten the short end of the stick on luck with the few balls he's hit relative to ground balls and fly balls and batting average on balls in play, but the sample size is so damn small that there's really no smoking gun there. But he certainly hasn't been lucky in any department. Saunders ought to be our starting left fielder. He is a very good defensive outfielder and he's got the pedigree of a guy that can handle the bat as well. He's 24, so it's not as if we are rushing a baby. But with the Gabe Gross and Jody Gerut pickups, it's either simply organizational depth or a signal that the team isn't terribly comfortable with their left field options. So Saunders probably has plenty to prove. 2011 isn't likely going to be the season the Mariners challenge for the pennant, so I get the sense that this will be the opportunity for Saunders to either do his business or get off the pot. He certainly has the potential to be an exciting player for the future of this team so here's hoping the front office has the patience to give him the at bats to adequately assess him. We are stockpiling left handed Spring invitees apparently to try the "scared straight" technique on Michael Saunders. The M's have picked up Gabe Gross on a minor league deal with an invitation to Spring Training. Where Jody Gerut was somewhat ho-hum, Gabe Gross is, well, eh... his Mother thinks he's damn handsome! There was something to write about Jody Gerut other than being a pretty good outfielder. Gabe Gross is a pretty good outfielder. Okay, really - Gross is known as an awfully good outfielder, he's 31, and once in his career has had a decent bat. Oh, man, I just threw up in my mouth a little bit because that's the most positive thing I could think to write. So Gabe Gross. 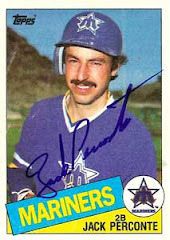 Mariner outfielder. Maybe. Please, no. News is so thin that you get a post on Jody Gerut! In what seems to be the "throw spaghetti on the ceiling and see what sticks" approach to left field, the M's went out and picked up Jody Gerut on a minor league contract with an invitation to Spring Training. The curious thing about Gerut is he very well could be the starter in left field on opening day or he could be cut and playing in the system of some other team. Both outcomes are probably equally as likely. That tells you how fluid the left field situation is for the M's. Gerut is an interesting player. His 2003 rookie campaign was actually quite good with a .279/.336/.494 line and 22 HR's in just 127 games. He was fourth overall in the rookie of the year voting, getting beat out by the likes of Rocco Baldelli and Angel Berroa, so I guess he should just be happy he's still around. Just two seasons ago, he was a 3.1 WAR player with the Padres, hitting .296 with 14 home runs, 46 runs, and 43 RBI in only 100 games. And then he turned into a pumpkin and was terrible in 2009 and even worse in 2010. There are some indications that he was just getting a raw deal in the luck department (.239 and .231 BABIP vs. a .279 career) but in general, in a brief stint last season, he was striking out a ton, the balls he did hit were smashed into the turf (61% ground ball rate - even Ichiro was at 57%), he was reaching for more balls out of the zone and making contact far less than he used to. But last year was just 32 games in the bigs, prior to that, he was tearing up the minor leagues with both the Brewers and Padres, so it's not like he is mailing it in quite yet. 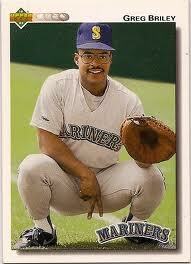 It's also worth noting that when he was a rookie his manager was Eric Wedge. Gerut has a history of being good and stinking horribly in cycles. So who knows, maybe this is a rebound year for him and we'll get a little lightning in a bottle. Jody Gerut. Mariner Outfielder. Maybe. Will Felix Repeat as AL Cy Young in 2011? Cast your vote now on our Facebook page here.